Chris, who is born and raised in Arlberg, has been skiing the mountains of St. Anton am Arlberg for all his life. So he surely knows his way around! 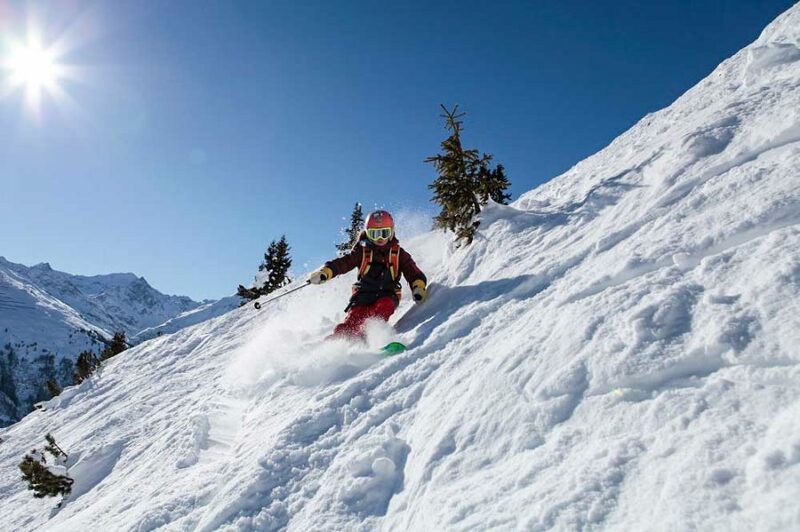 His passion to become a ski guide derives from his earliest ski courses. After first having obtained the traditional Anwärter, Landes, and Staatlich qualifications, he signed up in 2004 for what he considers the best of all instructor courses: Skiführer (Ski guide). Since meeting his Dutch partner in 2005, he joins her for half of the year in the ‘lowlands’. In addition to German and English, he is therefore also fluent in Dutch. In recent years, he has conducted the freeride-test for the Nederlandse Ski Vereniging (Dutch Ski Association). As a result of many years of experience, Chris finds the best and most beautiful runs and routes in Anton’s ‘Ski Heaven’; without losing sight of safety, of course. He is one of the few ski guides authorised to use the famous Valluga2gondola, which gives access to the best-known run in the Arlberg area: the “Valluga North”, running from St. Anton to Zürs. Chris prefers to have an early start, so as to good a full day in. His ability to quickly assess his individual clients’ strengths and weaknesses allows him to elevate them to a level where they achieve a top performance!